← Sea level rise: what’s the worst case? New data set: 500 million years of #CO2! It confirms what we already know but refuse to accept. CO2 levels in the Phanerozoic show a decreasing long-term trend probably associated to a decrease in tectonic rate (production), and very low values during ice ages, particularly the Karoo and Cenozoic (present) ice ages. Meanwhile Phanerozoic temperature shows a periodicity of 140-150 Myr, independently confirmed by fossil marine biological diversity, that is absent in CO2 records. The main coincidence between CO2 and temperature is in very low values during ice ages. One wonders if it is just the effect of temperature, or if ice ages also slow down tectonic production of CO2. It is well known that land volcanic rates are lower during glacial stages and increase enormously at deglaciations, probably due to ice-sheet unloading. I guess no research will be done on CO2 production during ice ages, as it is not a welcomed issue, but Vérard et al. (2015) already showed a reduction in tectonic rates during ice ages. Paleoclimatology is not very supportive of the CO2 hypothesis, but it is being tortured to conform to the story-line. Slightly worrying, tectonic rates indicate in 50-100 Myr plates will stop drifting and then CO2 levels will fall to levels too low to support complex-life trophic chains. It will be back to a microorganism planet. On the bright side we don’t have to worry about the Sun becoming a red giant and scorching the Earth. Appreciate the post, Javier, I find such topics very interesting. Excuse my forthcoming layman approach to questions relative to the science, but I’m intrigued by geothermal activity, especially deep ocean where many questions still remain. Since land volcanic rates are lower during ice ages, would it be logical to extrapolate such conditions could lead to increased volcanic rates in deep oceans, especially areas where the crust is thinner, i.e. relative to expansion tectonic zones? I understand that it’s difficult for explosive volcanic forces to occur in deep oceans because of the water pressure, but with pressures approaching somewhat equlibrium in many places on land with that of the deep ocean during an ice age; would the effect be like squeezing one end of a balloon, forcing air to areas of lesser pressure? If not explosive forces (since the pressure in deep oceans doesn’t go away), perhaps a substantial increase of lava oozing at great depths, possibly at super volcano amounts; would markers in core data be readily seen if such a scenario occurs? Even so with unusually large amounts of oozing, anomalous to typical geologic activity? So now the “what if”. If an anomalous deep ocean volcanic event occurred that heated the oceans at great depths, say around 20k years ago, could it be that we’re still witnessing a cascade of events associated with such an event to this day, which began with the end of the LIA? There is very little knowledge of current deep ocean volcanic activity, and probably none during the glacial period. However it is known that ocean bottom volcanic CO2 gets dissolved in water before reaching the surface, a process that should be more efficient with glacial colder oceans. It is not possible for a deep volcanic event to warm the oceans. The oceans are huge. The energy coming from the Earth’s interior has been calculated and it is several orders of magnitude too small to make a difference. Even the energy dissipation from tides is higher. Javier, Much appreciated. That’s why I ask the experts. Javier. one more question just to prove how anally retentive I am, then I’ll go back to the science spectator bleachers. Okay, forget about the deep ocean slant, and holistic oceanic warming. The facts you present relegate those specific ideas as a dead end. It makes sense. I redirect the same general premise towards localized regional events during the LIA, in particular shallow oceans where expansion tectonic zones existed near the periphery of glaciation during the LIA, a period when oceans were less deep. Can it be extrapolated that with immense forces exerting downward pressures on land from glaciation, with the intrinsically strong pressures of deep oceans, that vulcanism found its release in areas of less resistance? Shallow oceans? Further, If pent up forces were eventually released in shallow ocean expansion zones could a zipper effect occur caused by abrupt and violent volcanism, opening up deep and ever widening fissures in glaciers; advancing towards the poles as pressure was continually released in a cascade effect? I’ve got nothing else lol. I’m sorry. I don’t think I know enough to answer your question. I don’t know if anybody has raised the scenario you describe in the literature. I must add that as far as I know there is very little knowledge of underwater volcanism at deglaciations, and that while the LIA and a glacial termination might have some similarities, the scale appears to be very different. Javier, thank you once again for your time. This helps me triangulate where the frontier of science is relative to oceanic vulcanism as it relates to climatology. It’s an irony how many blame humankind predominately for the worlds woes, but in fact a cascading series of events of some capacity (whether or not in the way I contemplate) undeniably served as the catalyst to advance the human species culturally and technologically, we’re a byproduct of catastrophic events. Maybe instead of warmists seeing humans as the main fault, they instead consider us the bit player we are, along for the ride from the same forces that set us in motion to begin with. Environmental forces have no sentimental consideration to us and will continue on unabated until some form of an equilibrium is met, at which point a new environmental paradigm shift will force humans to yet again mitigate an entirely different set of circumstances. Obviously humans contribute to our environment, but we’re hardly the “everything” responsible for it. For our part, the human self-correcting mechanism found in the exponential growth of technology will enable us to overcome these challenges, moving beyond; irrelevant to blame. There’s much bigger things to worry about in the form of human-on-human catastrophe, the Lefts growing fascism, frankly. Radisondes showing the stratosphere has been warming for the last 15 years. Does that mean another one of the planks proving AGW has collapsed? Scientists discover bacteria: I just love scientific discoveries. ‘We discovered that benthic bacteria are taking up large amounts of carbon dioxide and assimilating it into their biomass through an unknown process. I’m wondering if there could be a symbiotic relationship with the undiscovered penguins? Thanks as always, Dr. Judith. There’s a missing link to the Hartmann paper. The Essex and Tsonis abstract looks like it would be a terrific read. .. average of weather ..
Back when evolution was under attack from proponents of Biblical Creation and Intelligent Design, academic scientists were under no pressure to hold back criticism. This is because these anti-evolution movements were almost exclusively a product of right-wing evangelicals who held no power in academia. Now we have a much bigger problem, because evolution denialism is back, but this time it’s coming from left-wing activists who do hold power in academia. Which, essentially, justifies both the postmodernist, as well as the traditionalist attitude that science is, primarily, the intellectual ideological enforcement arm if the elites. It is truly beatiful to watch the enlightenment ideologies devour themselves. I agree, nickels. The 19th centuries top intellectual doctrine was social Darwinism and racism. Communism was also there just beneath the surface. That was more or less taken off the top list by WWII. However, no terrible idea ever dies permanently and the new cultural Marxism’s emphasis on race and gender is the re-emergence of a bankrupt but quite good idea. Yes, social Darwinism is really something. When I read the Fuhrer’s writings, I can’t but understand he is essentially the culmination of evolutionary science, a truly perfect student of the ideology. Yet, for nearly a half century, the standard anti-God SJW had the same underlying ideological outlook (life is but the evolutionary struggle for expression), but was too cowardly and cognitive dissonant to take his (her/its/their-lol) theories to their natural conclusions. But-and one may or may not partake-it doesn’t take long studying the whole evolutionary project with an open and intelligent mind to see what a metaphysical and scientific absurdity the whole thing is. But the SJW is still confused and wants their cake and dessert, all at once. Probably an improvement at any rate. While the universal acid of evolution eats through old cherished beliefs and replaces them with deeper understanding and a clearer picture of reality, the anti-universal acid of social justice ideology is a recklessly destructive force, aiming to abolish scientific truth and replace it with relativistic postmodern nonsense. SCOTTSDALE, Ariz. — Peter Thiel is an optimist. But a “reformation” needs to happen first, the billionaire tech mogul and libertarian philanthropist said.. . .
During his speech, he spoke of an academia that has shut down debate, excommunicated conservative scholars, and insisted a college degree is the only way to “salvation,” that being a good job and solid future. “The reformation is going to happen,” Thiel added, noting it won’t come from within, but from the “outside.”. . .
A similar challenge for orthodox evolutionists is the recent discovery of a widespread “founder effect” in mitochondria DNA and in Y DNA based on the rapid quantitative mapping of numerous human genomes. e.g. Stoeckle, M.Y. and Thaler, D.S., 2018. Why should mitochondria define species?. bioRxiv, p.276717. Mitochondrial barcodes provide a commensurable way to compare modern humans to other animal species. Barcode variation in the modern human population is quantitatively similar to that within other animal species. Several convergent lines of evidence show that mitochondrial diversity in modern humans follows from sequence uniformity followed by the accumulation of largely neutral diversity during a population expansion that began approximately 100,000 years ago. A straightforward hypothesis is that the extant populations of almost all animal species have arrived at a similar result consequent to a similar process of expansion from mitochondrial uniformity within the last one to several hundred thousand years. Carter, R.W., Lee, S. and John, C., 2018. An overview of the independent histories of the human Y chromosome and the human mitochondrial chromosome. In The Proceedings of the International Conference on Creationism (Vol. 8, No. 1, p. 7). From a climate change perspective, these suggest that humans have accommodated very large temperature changes from the glacial to the present Holocene interglacial period. I’m convinced that a lot of the writing on energy and the grid is a pro renewables propaganda strategy, whereby a bunch of extraneous verbiage is added to belabor the obvious. I have to give that VOX piece credit for coming up with a new tactic — add a new three or four letter acronym every third or fourth paragraph, in order to make the whole thing unskimmable. This makes it more resistant to dismissal by those who’ve heard it all before. Yes – the “expert” they extensively quote is a heavy electrical engineer or someone with hands on experience at running a grid. From his biography: “He has a B.S. in mathematics from Manhattan College, an M.S. in statistics from North Carolina State University, and a Ph.D. in economics from the University of California at Davis.” so he is a theoretical policy boffin who wouldn’t know VARs or inertia if they jumped up and bit him. I thought the Vox article at least helped defined the problem. Something like, There is a problem. I didn’t like the small scale production. That will be more expensive. I figure it makes no sense to put solar panels on roofs. Commerical makes more sense. Mark Jacobson’s 50 state plan calls for 3.98% residential and 3.24% Com/Gov PV rooftop, and you can bet he didn’t leave any roofs uncovered! For comparison, he has 30% solar PV plant and 7.30% CSP plant. Canman: I’ve looked some of our local commercial installations. So much more efficient. Not that I favor them. One thing about businesses. They don’t complain as much as the average Joan who has been promised the sky and bought into it. A utility can cut a deal with a commercial installation. The homeowners can complain until the cows come home to their politicians. I have to smile. The authoritative use of “doctors” on issues of human health would seem appropriate. That is, until one reads the entire list of authors and…drum roll, there is one doctor of the almost 100 authors, and he? involved as far as his brief biography allows in administration, in England. Most of the dire consequences of human caused climate change, that is without the abolition of fossil fuels to power the world, will be from moving mosquitos North, North to Alaska! Well, my friends, the mosquitos that carry all the damned diseases at the equator also happen to live or have lived North of the Tropic of Cancer and South of the Tropic of Capricorn. Right here in the Great Lakes region, those pesky malaria transmitting mosquitos lived right here only, and this is a real only, the population density of mosquitos were decreased by the application of DDT and the drainage of wetlands by large drain projects, such that the malaria didn’t have enough mosquitos biting human contacts to perpetuate the parasite; hence, it died off. There are other tales of heatwaves killing off many millions in the near future. There are of course other claims to be….continued. This article, at least to me smacks of an overly zealous attempt to continue the alarm dialogue to influence policy makers to…. First of all I want to give a shout out to Rachel Carson and her 1962 best seller; The Silent Spring which facilitated the deaths of millions of children from the complications of malaria (yellow skin, seizures, coma, brain infarcts) world wide by hounding governments to discontinue DDT used in the control of the Anopheles mosquito, the carrier for the parasite. Thank you environmentalists. Your legacy will be untold. Next I want to thank the Zika virus for facilitating simplistic thinking on the part of the medical infectious disease establishment for leading them astray. After several years of infecting pregnant women with the resultant profound and tragic neurological complications for their fetus/newborn, after a rushed effort to develop a vaccine against Zika virus, the virus didn’t show up to the party and the large vaccine trial could not commence as no one was infected with Zika. The virus just left. Good news for people who are vulnerable, bad news for scientists who demanded and received crash funding for vaccine development. Kinda like the scientists didn’t know the full story before proceeding with vaccine development and trail. There are lots and lots of tidbits of the climate change making human health worse story, that are also not true. Only, these tales are not likely to see the light of day, and, for good reason. Think of the just these 100+ authors, serious researchers and administrators who would have egg on their face. They are unlikely to come forward and say: I was wrong. DDT was not available when the incidence of malaria was reduced to the shaded areas on that map. Many countries continued to use DTT long after the US ban for agricultural purposes in 1972. There is insecticide resistance. There are wars and political upheavals that disrupt disease control efforts. Maybe if westerners had gone into Africa with fewer bibles and more gallons of DDT, more children would have lived. Of course you are correct that DDT was used after the US ban. But, the widespread use in the malaria impacted areas of Asia, Africa and the Middle East was already curtailed. Those were the locations where there was the greatest need and the greatest efforts to suppress it use, successfully. The DDT ban certainly helped save the Bald Eagle in the tropics, didn’t it? Oh, BTW, Bald Eagles habitat is from far Northern Mexico to Alaska besides having a preference for great open bodies of water; ie, Great Lakes, etc. Banning DDT was suppose to save the Bald Eagle’s eggshells from thinning. Now, let’s see, how’s the science on that today? Then again, the environmentalists had to pass legislation to exempt wind turbines from laws against killing endangered species like Bald Eagles, Condors, and other raptors as the dead birds began piling up under the wind turbine’s blades. If it isn’t one thing, its another. They did not ban its use in the tropics. Was it due to DDT? That I can find, the first military usage of DDT was by the US Army in October 1943 in Naples, Italy. Congratulations and honor to your father who served at Guadalcanal. After DDT was use by the military, it became globally available and used as a pesticide for many pests that damaged crops including in the tropics. DDT’s use became widespread and in great quantities, especially in the tropics. This use became overuse and after Carson’s book and our Government leaning on other nations’ governments, DDT was withdrawn from the market. It’s use at the time as an anti-vector agent in the transmission of the malaria parasite also plummeted and the deaths from malaria, especially newborn and young children was great. 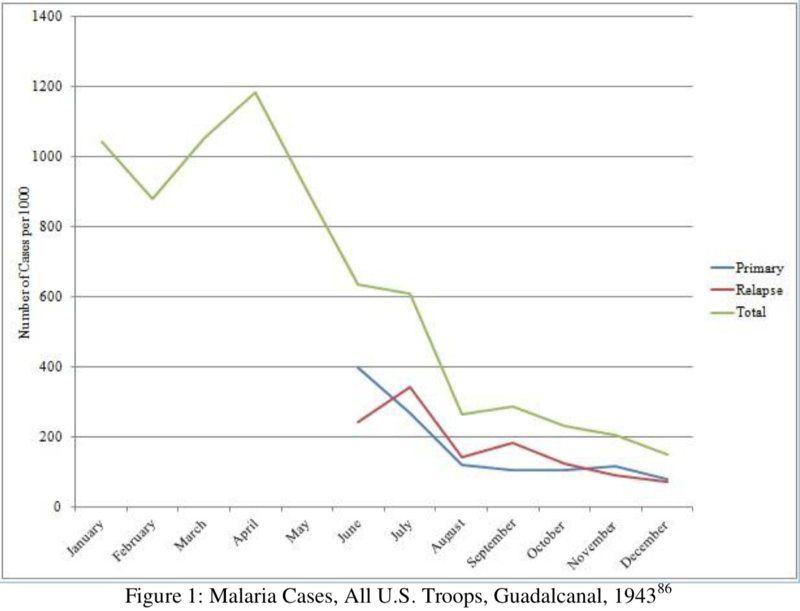 Counting deaths from malaria alone was hard to do especially with the deaths from measles complicating public health efforts to initiate vaccines. In addition, children dying from diarrhea was being tackled by efforts to provide non-contaminated water supplies and electrolyte solutions. So, millions of children were dying and efforts to identify the children only dying of malaria was not felt to be a priority. Only in the last several decades has there been a better understanding of which public health issues need which resources and how much. DDT applications should be reintroduced more widely as a positive malaria death reducing program. A big part of the elimination of malaria is the rise of the middle class. Big factors are single family homes. Separate bedrooms. Screened windows. “The new evolution deniers” – Climate Change will kill us! ANY Change will kill us! The very notion that a change is dangerous is anti-evolutionary. They twitter on about polar jets and tipping points and it is a dismal science when Trump is more correct. Lots of good articles here. The RSS one is quite interesting concerning trends of models vs. their measurements. Models look to me to anywhere from a factor of 2 (tropics) to a factor of 1.5 (global) too warm confirming that models are not very reliable in these matters. Solar wind conditions influence the Arctic Oscillation. The solar forcing of the AMO is also missing. Stronger solar wind states result in positive NAO/AO conditions, driving a colder AMO and Arctic. 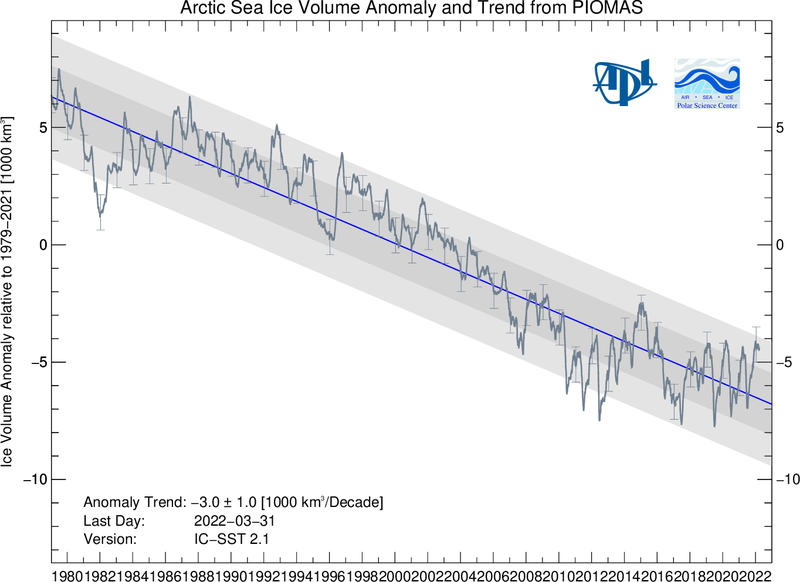 AMO-Arctic warming since 1995 is the result of a net decline in total climate forcing. Polar amplification is an illusion. More like the slow MOC has driven Arctic ocean warming. The Gulf stream hasn’t slowed, so where would the warmer flow be going if less is overturning? Negative NAO/AO due to low solar as in summers 2007 and 2012, those wouldn’t have even happened without the solar variability. This one is a rather bizarre piece of pro-immigration globalist propaganda. The author seems to have a distant echo of an understanding that labor, i.e. adding value to products, is the only sustainable source of value. He, mistakenly, equates minds with this labor-minds are only labor if there is work for them to do. In fact, what we have seen is that the outsourcing of manufacturing jobs has produced no new technical, i.e. mental, jobs-the only remaining jobs in Western deindustrialized countries are waitresses and nurses. The author also completely ignores the concept of competition and a living wage-the only path to sustaining a workforce, and, instead, opts for mass immigration, which will drive down wages and destroy the possibility of affording to raise families. This is essentially the genocide of native peoples in trade for low wages and replacement by (presumably) third world immigration. This certainly benefits the Oligarchs, at least temporarily-until immigration destroys social cohesion and results in revolution and chaos. The other problem, of course, is that the same low wages that enrich the elites are essentially collapsing demand for their products as the mass of people become impoverished. If this had been a term paper for kindergarten it might be on par, but it is quite shocking that our elites put this kind of insanity to press. Let’s bet the economy and Western civilization on that…! Real scientists do not pretend to know in fifty years what the global climate of the world will be. Nevertheless, the legitimization of a secular, socialist state bureaucracy demands just that from government-funded scientists. The Essex and Tsonis paper is from earlier this year and uses the standard arguments that haven’t for some odd reason made much headway in decades. But here’s one from last month. The claimed inverse relationship between tropospheric warming and stratospheric cooling is illusory and a creation of spurious correlations. Dust hypotheses for glacial termination not supported by evidence. From Frank Furedi, Authority – A Sociological History”. In reading the paper on the Jakoshavn glacier, it made me wonder how the retreat of Greenland glaciers of today compared to what was being evaluated in 1903 for the previous 53 years. 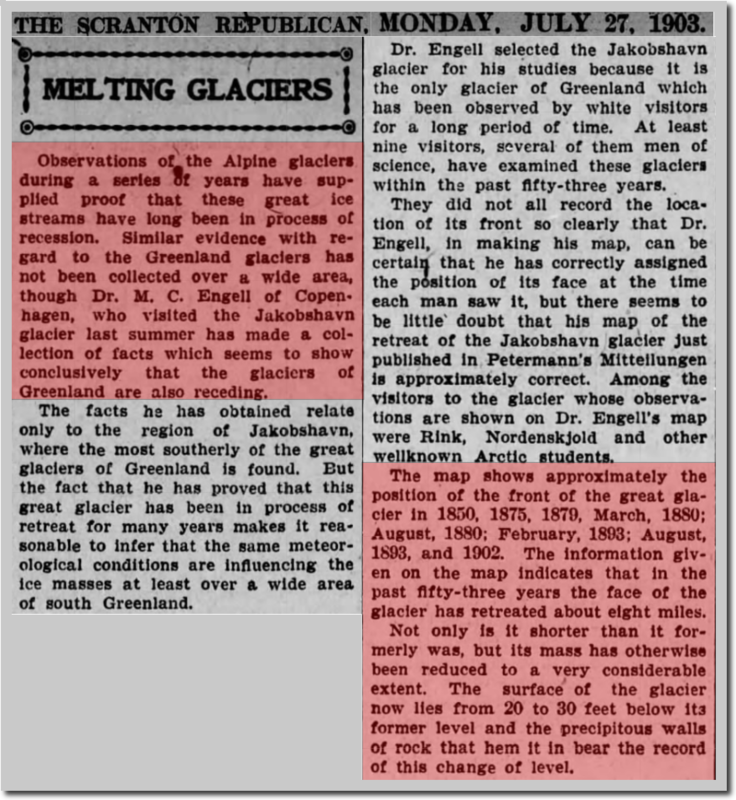 In 1910 there was awareness that glaciers were receding in locations beyond Greenland. 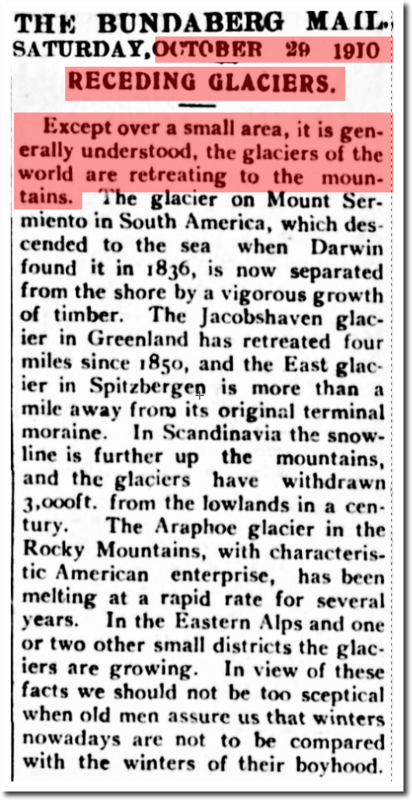 And just a few years later more glaciers were identified as receding. Then in 1923 there was concern that Glacier National Park might lose its iconic landmark in 25 years. Even in 1952 the most prescient ones were concerned about the tipping point in Greenland and having SLR of 17 feet in a generation. In nearly 70 years same tipping point concerns with little evidence of such. Previous studies have outlined benefits of using multiple model platforms to make seasonal climate predictions. Here, reforecasts from five models included in the North American Multi-Model Ensemble (NMME) project are utilized to determine skill in predicting Arctic sea ice extent (SIE) during 1982-2010. Overall, relative to the individual models, the multi-model average results in generally smaller biases and better correlations for predictions of total SIE, year-to-year (Y2Y), linearly, and quadratically detrended variability. Also notable is the increase in error for NMME predictions of total September SIE during the mid 1990s through 2000s. After 2000, observed September SIE is characterized by more significant negative trends and increased Y2Y variance, which suggests that recent sea ice loss is resulting in larger prediction errors. While this tendency is concerning, due to the possibility of models not accurately representing the changing trends in sea ice, the multi-model approach still shows promise in providing more skillful predictions of Arctic SIE over any individual model. * ‘Sea ice loss is resulting in larger prediction errors’ :) Say, droll cause/effect suggestion of wording. * ->nevertheless the multi-model approach still shows promise in providing more skilful predictions of Arctic SIE over any individual model. Many wrong make righter? Kinda’ makes yr recall, in reverse, one tree ring to rule them all. Either way … . In warm times, less sea ice promotes more evaporation and snowfall and a little ice age follows a medieval warm period. In cold times, more sea ice promotes less evaporation and snowfall and a modern warm time follows the little ice age. If correctly used, sea ice is a good predictor. They don’t yet understand sea ice and they use it incorrectly to predict about the opposite of what is real. We should know what is real, we have history and ice core data. Discrepancy between models and observations? In other words, if volcanoes are not providing any additional cooling, glaciers cannot maintain their large tongues, Sigl explained. “They retreat back to their original positions,” he said. Cooling does not cause glaciers to grow. Warming does not cause glaciers to retreat. Ice ages are caused by ice. Evaporation and snowfall comes from thawed oceans in warm times, rebuilds the glaciers and the advancing ice causes colder. During the colder times, like the little ice age, northern oceans were frozen, covered with sea ice, it snow less because oceans were not exposed to allow evaporation and snowfall. The glaciers retreated because they were always still flowing and they were not being replenished, it warmed because the glaciers retreated. Colder from volcanoes would freeze more ocean and reduce evaporation even more and cause faster ice retreat. Ice ages are when there is more ice. Warm periods are when there is less ice. Warm periods rebuild ice and it does get colder. Colder periods allow ice to deplete and it does get warmer. This natural cycle is ignored by most all. During recent decades, the scientific community has fundamentally advanced climate science to the point that quantitative projections of the future evolution of global climate are routinely provided. Wow, they allege that these projections are useful. That has not been proven. They pat themselves on the back in every section of this article. They never prove any of the praise is justified. It’s a timing difference. While we can follow rules, it’s still subjective. You release carbon from the soil upfront but then gain back over the years. It’s the same as investing. Like putting money into a 401(k). Don’t do it because it will hurt upfront. That’s one point of view. Don’t ever save or sacrifice for your future. It’s not surprising they portray this in its worst light. It’s still accounting, but there are ways of accounting and then ways of using in words whatever way of accounting that best serves the purpose or your argument. Does this sound familiar? Same kind of deal with activists describing fossil fuel subsidies. Account the way that best make yours point, and then spin it to make it sound even worse. A relative of mine farms corn and beans (soybeans). More relatives rent their land to him and his wife. I would guess, most of us are in favor of palm oil and ethanol if we care, but we have a few hippies in the family. In order, I have been for it, against it, mildly in favor of it, and now mildly against ethanol in our gasoline. The palm oil article above tells a story of tragedies. Government swinging huge amounts of money for a goal. Crossing borders into situations we did not and do not understand. But as long as somebody makes Iowa voters happy, that’s the point. And lets do twice as much of this kind of thing. A more consumer driven deal might have worked out better. I say, give me ethanol in my fuel but leave the government out of it. In that case, I may not get it, and if I do, and it may happen slower and less tragically. Call it Borneo. An argument is they want money and energy. We have that. Why should we suggest they don’t? Why don’t we say, You shouldn’t have money because of our stupid ideas to save the planet? So the next thing we do is make it so they have less money. I thought we stopped that kind of thing. This was called Colonialism. It’s accounting again. We sacrificed all kinds things to get rich. We didn’t care about our land. Where did all our forests go? But then we got money, and now we are better. I want money to give to farmers to turn their land back into prairies with deep rich soil with all kinds of carbon in it at depth. That’s how much money we have. Who is to say they will not get there someday? We spent all kinds of natural stuff, and then later put a lot that back, because we had money from sacrificing all kinds nature. Maybe rather than fighting over carbon accounting, we should just try and figure out what’s best for the people of Borneo, without throwing a lot of money at anything directly or indirectly? First do no harm. But as we ramp up the threat of global warming and spend more money on that and virtue signal, what do we expect? The money knows. And Borneo is one bleeped up place in part because of us. Our ideas can rarely if ever beat money. Money being another name for value. Our grand visions can rarely if ever beat value. All our stupid ideas eventually are born out using the measure of value. Value is so many things. It’s being able to provide for your family for one. Their health. Their future. Now we are stuck having to figure out how and/or if to fix what we did? Maybe we can find some more things that need fixing. Like wind turbines and solar, this problem will be with us for a long time because of those world saving parades we had in the past. Where we gave ourselves awards for doing that. And pointed out climate deniers who wanted to throw rotten fruit at our parades. I noticed this while disabling OK Google on my new android phone so people can hear my side of phone calls. Grrrr…. Gavin has written off 2018 and is relying on El Nino to rescue 2019. Sorry about the tag – but now I know how to do it. The next MEI (Oct/Nov) is due in a week or so. My feeling is that the 2018 ‘El Niño’ has been and gone. There are no elevated water levels in the western Pacific – no geopotential energy to drive El Niño. There has been no ‘recharge’ since the 16/17 El Niño. Nothing obvious has changed in the eastern Pacific in the past month. The gyre hypothesis is that the southern and northern polar annular modes (SAM and NAM) – the surface expression of polar vortices – change flows in the Peruvian and Californian currents that in turn modulate upwelling in the eastern Pacific. Upwelling initiates cascading tipping across the Pacific that results in a western warm pool with elevated water levels. Atmospheric instabilities there – the Madden-Julian Oscillation perhaps – allows warm water to flow east again completing the ENSO cycle. You can believe models that have no skill in picking ENSO transitions or you can resort to principles of fundamental physical oceanography. No skin off my nose. But the next La Niña is coming – and that’s not much of a prediction – it always does. We currently have an El Nino Modoki, where the warming is focused in the central pacific. Modoki are the reason I generally ignore regional sea surface temperature indices in favor of the SOI and MEI. Here’s the La Niña Modoki in early 2017 that resulted in major flooding in Queensland and California. Canonical El Niño/La Niña Modoki involves the development of double Walker cells in the equatorial Pacific. Here’s the boxes used for the El Niño Modoki Index (EMI). The last weekly value calculated at JAMSTEC is 0.58 in early November. So moderately on the side of El Niño Modoki but nothing to get exited about. 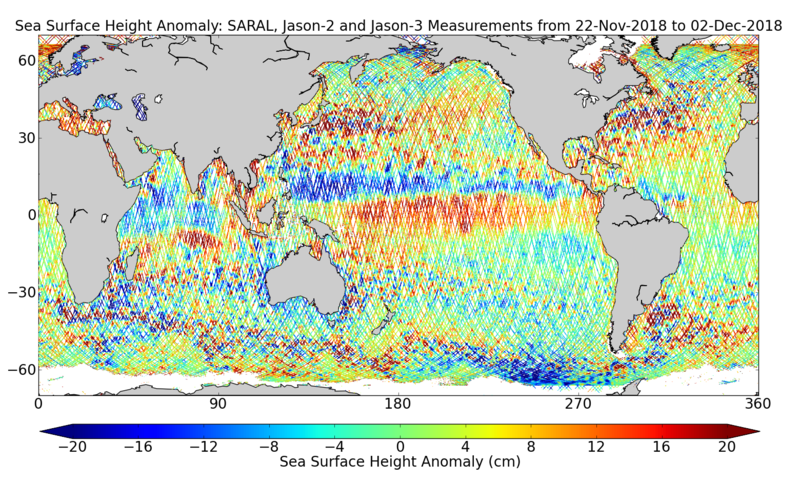 Sea surface pressure variations – dark is lower – although inconsequential show the La Niña pattern rather than double Walker cells. It’s a holding pattern but that will change of course. The tropical Pacific Ocean remains ENSO-neutral, despite some indicators reaching El Niño levels. As a result, the Bureau’s ENSO Outlook remains at El Niño ALERT. The positive Indian Ocean Dipole (IOD) event in the tropical Indian Ocean weakened in the past fortnight. His plot shows about 0.8 C in the past 40 years. Who needs a pause? That’s 2.0 C per century. Where is the breakout upwards? I think the oceans are going to protect us. Which is probably their job. Oh it’s much worse than that for Gavin and ilk. That’s global stadium wave – GSW. If WP didn’t have an emoji glitch I’d LMFAO. Palm oil link is incorrect. The RMSS link is worth a look. It shows that even with recent upward adjustments to their satellite data sets that CMIP5 is predicting a lot more warming than their data shows particularly in the tropics. If one were to use UAH data, the difference would be quite striking. Interestingly, the writeup links to a Skeptical Science post and a paper by Santer that are focused on limiting the damage from the discrepancy. The Santer paper shows that the discrepancy cannot be explained as due to internal variability but instead blames forcing estimates used for CMIP5. It is fun to watch the very hard work involved in rationalization by people like Santer. I guess the belief in the models is very strong. Reading down the list of links, I get the strong impression that everything is based on the premise that global warming is would be damaging not beneficial. Why is no work being done to test the validity of this underlying presumption? I get the black line. AR5 blue line is something. Where? The black line doesn’t have error bars around it. So what I learned it, it was predicted, it was hard, it just got done not too long ago. And high sensitivity require high OHC uptake. I learned there was recent acceleration. That’s a mixed bag. Now if the ocean keep upping their rate, we only have to worry about SLR. High sensitivity means, stuff will stay in the oceans. Can’t have your cake and eat it too. Abstract: Ocean heat content (OHC) is the major component of the earth’s energy imbalance. 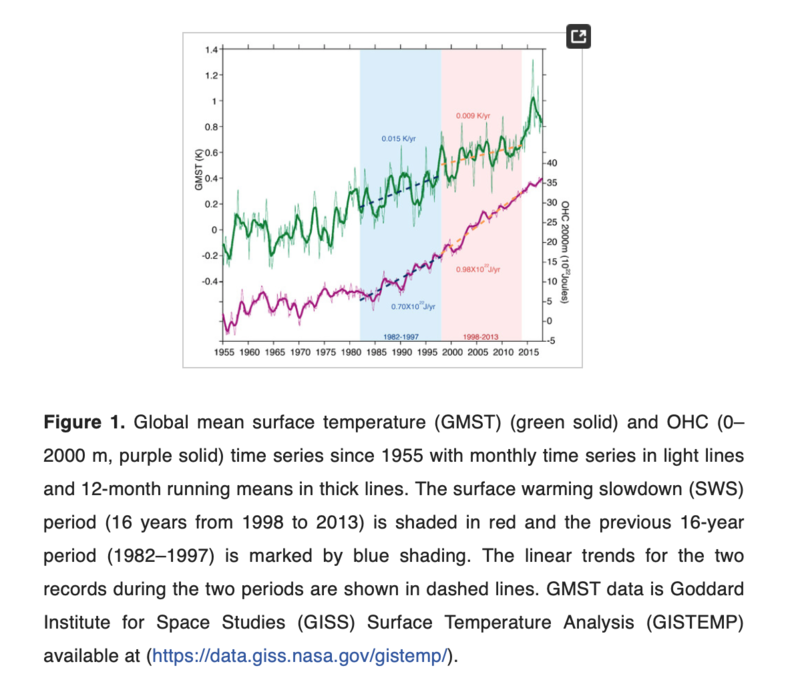 Its decadal scale variability has been heavily debated in the research interest of the so-called “surface warming slowdown” (SWS) that occurred during the 1998–2013 period. Here, we first clarify that OHC has accelerated since the late 1990s. This finding refutes the concept of a slowdown of the human-induced global warming. This study also addresses the question of how heat is redistributed within the global ocean and provides some explanation of the underlying physical phenomena. Previous efforts to answer this question end with contradictory conclusions; we show that the systematic errors in some OHC datasets are partly responsible for these contradictions. 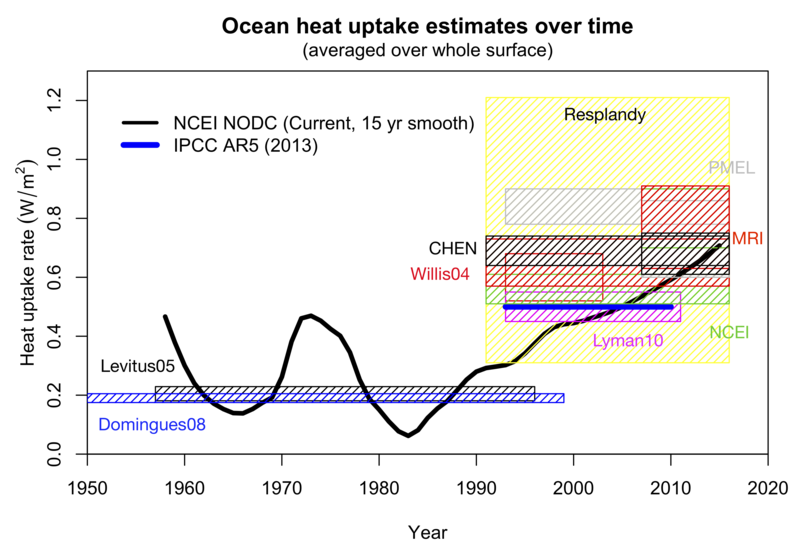 Using an improved OHC product, the three-dimensional OHC changes during the SWS period are depicted, related to a reference period of 1982–1997. Several “hot spots” and “cold spots” are identified, showing a significant decadal-scale redistribution of ocean heat, which is distinct from the long-term ocean-warming pattern. To provide clues for the potential drivers of the OHC changes during the SWS period, we examine the OHC changes related to the key climate modes by regressing the Pacific Decadal Oscillation (PDO), El Niño-Southern Oscillation (ENSO), and Atlantic Multi-decadal Oscillation (AMO) indices onto the de-trended gridded OHC anomalies. We find that no single mode can fully explain the OHC change patterns during the SWS period, suggesting that there is not a single “pacemaker” for the recent SWS. Our observation-based analyses provide a basis for further understanding the mechanisms of the decadal ocean heat uptake and evaluating the climate models. So ocean warming at some 0.7 W/m2 since 1990? But the question is still how much is intrinsic – and how that works. I don’t think any of it is intrinsic. Well his deeply considered opinion is enough for me. A chart of real value would be one that began in 1840 rather than 1940. But I guess we are resigned to just guessing. 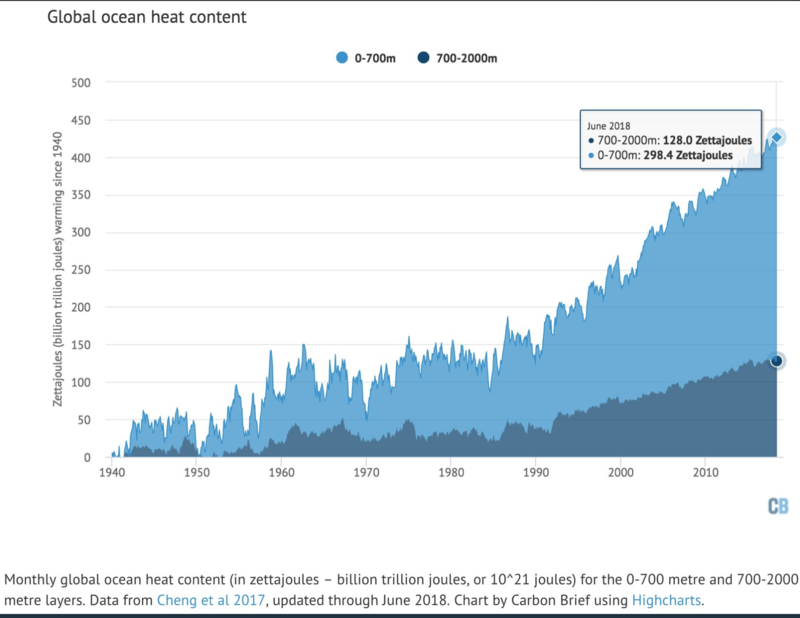 Most of the excess energy stored in the climate system due to anthropogenic greenhouse gas emissions has been taken up by the oceans, leading to thermal expansion and sea level rise. The oceans thus have an important role in the Earth’s energy imbalance. Observational constraints on future anthropogenic warming critically depend on accurate estimates of past ocean heat content (OHC) change. We present a novel reconstruction of OHC since 1871, with global coverage of the full ocean depth. Our estimates combine timeseries of observed sea surface temperatures, with much longer historical coverage than those in the ocean interior, together with a representation (a Green’s function) of time-independent ocean transport processes. For 1955-2017, our estimates are comparable to direct estimates made by infilling the available 3D time-dependent ocean temperature observations. We find that the global ocean absorbed heat during this period at a rate of 0.30 ± 0.06 W/m2 in the upper 2000 m and 0.028 ± 0.026 W/m2 below 2000 m, with large decadal fluctuations. The total OHC change since 1871 is estimated at 436 ±91 × 1021 J, with an increase during 1921-1946 (145 ± 62× 1021 J) that is as large as during 1990-2015. By comparing with direct estimates, we also infer that, during 1955-2017, up to half of the Atlantic Ocean warming and thermosteric sea level rise at low-to-mid latitudes emerged due to heat convergence from changes in ocean transport. Now watch you muck it up. Is this article in press? I can’t find a copy. Here’s a graph – but unlike JCH I really would need to see the study before plastering the abstract in block quotes. It’s quite impressive that they were able to get “global coverage of the full ocean depth.” Even in the abyssal waters of the Mariana Trench, no less. Perhaps President Grant contracted with Captain Nemo and the crew of the Nautilus to make those really deep dives below 2000m. I noted the increase of 145 in OHC during the period 1921-46 was as large as the period 1990-2015. Assuming a lower base for 1921-46 it appears the % change is greater in the earlier period than the recent period. Pardon this dumb elementary question, but if there is stored heat in the oceans, do we have to fear it? The fear that something will drive it elsewhere to make us hotter? What is the driving force postulated to do this stripping of heat from the oceans, some of it deep oceans? Cannot it just sit there in a new, ever so slightly warmer state? Geoff. Yeah it’s a dumb question. Can I explain turbulence and convection – let alone maximum entropy in a system far from equilibrium – in a way that you can grasp? But changing the composition of the atmosphere is a really dumb idea. Geoff Sherrington: but if there is stored heat in the oceans, do we have to fear it? What Mr Ellison didn’t say is that there are known flows (and probably some yet to be discovered flows) bringing deep ocean water to the surface. If the temperature of that deep ocean water were to increase, there could be disturbances to the natural ecologies where that water surfaces. For example, in the eastern Pacific, upwelling nutrient-rich cold water feeds the anchovy population; conjecturally, if the upwelling water were a little warmer, that might harm the anchovies at some stage of their life cycle. So, look to the flows. Another favorite is the thermohaline circulation. Because they need light, phytoplankton live near the surface, where enough sunlight can penetrate to power photosynthesis. The thickness of this layer of the ocean—the euphotic zone—varies depending on water clarity, but is at most limited to the top 200 to 300 meters (600 to 900 feet), out of an average ocean depth of 4,000 meters (13,000 feet). One man’s deep ocean is another man’s not-so deep ocean. “Deep” ocean temperature is getting ever so slightly less ice cold, and is never going to kill off phytoplankton. There is turbulence and convection. Turbulence is created by planetary rotation, flow over seabed mountains and valleys, wind at the surface and density gradients. Warm water rises to the surface by convection and turbulence carries it to the abyss. The sun warmed surface layer is a barrier to cold turbulent currents breaking through to the surface. Where it does on the western margins of continents it brings cold and nutrient and carbon dioxide rich water to the surface. Where it does reach the surface these areas are carbon dioxide sources rather than sinks. You will find that the zooplankton and phytoplankton assemblages are different in upwelling zones than in open oceans. In upwelling zones there is a wild profusion of life. In open oceans there is an unparalleled efficiency in recycling nutrients. Helped by the ability of some organisms to sink to hundreds of meters depth both to graze on falling detritus and to avoid predation. There are no linear sub-systems here and we are making small changes with no understanding of the consequences. Big data and empirical dynamic modelling may help – but data here is hard come by. In the “The Pros and Cons of Carbon Taxes and Cap and Trade Systems” the author says: “Carbon pricing policies are generally considered to be cost-effective. With a carbon tax, emitters get to decide how much they reduce emissions.” I am always amazed at the disconnect between the economic theory of a carbon reduction scheme and the reality that there are no cost-effective control systems. Emitters primarily reduce emissions by running less or switching fuels. Fuel efficiency improvements are usually cited as an option but any carbon reductions are small relative to the reduction targets. Ultimately, the only way to meet the proposed targets is to replace emitter emissions with carbon free sources and the emitters have no way to decide how to reduce their emissions. I liked your submission – good work. This Canadian carbon tax puff piece is another story. Canada is lightly exposed in the electricity sector. And I suppose they could price oil and gas out of the mix. Their power costs are low in the global context. Lower than mine. Leaving residential heating, industrial processes and transport. This requires a technological evolution across sectors that I am all in favor of. But taxes are less important than international movement in oil and gas prices. And while oil prices have come off their highs of recent days – longer term prospects are less than reassuring. 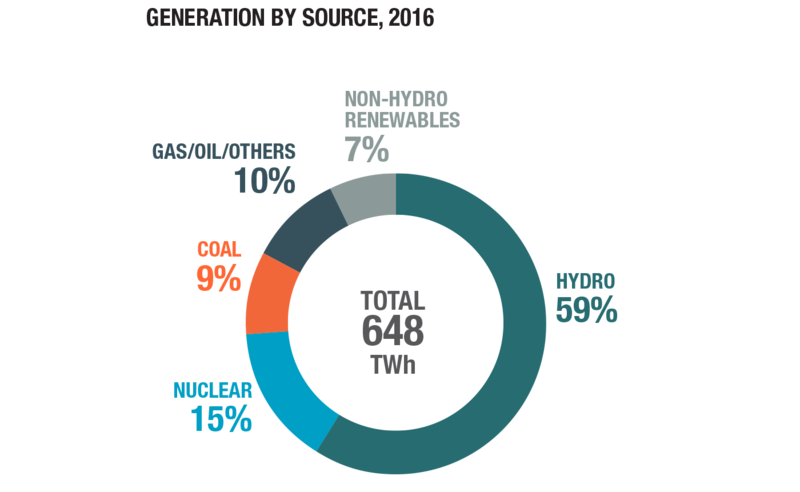 But in this typically simplistic graphic from the report the problem of determining the social cost of carbon remains unresolved. Marginal benefits are shown as both positive and horizontal – the latter because nothing Canada can do will change global emissions much. Not an argument – btw – for not doing it. Marginal costs are shown as linear increasing against emission reductions. The intersection may or may not be the optimum cost of carbon. 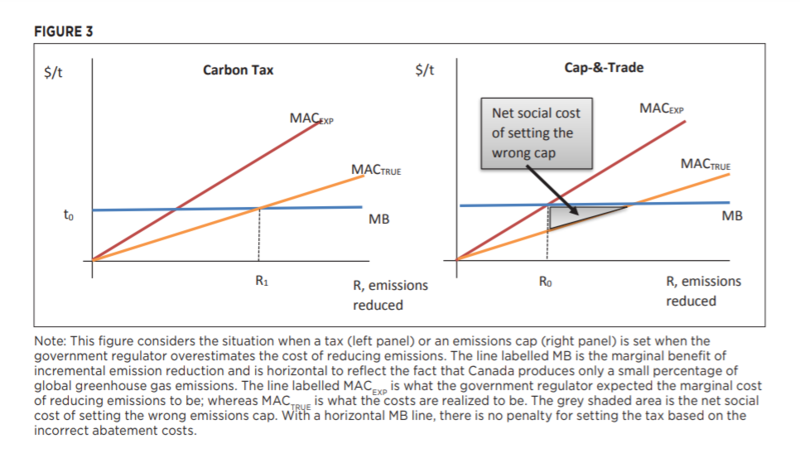 The pros of carbon taxes is a fixed and certain cost – and of cap and trade fixed emission reductions – and the fact that it is less visible (salience) to consumers. Neither seems likely to be any huge factor in the Canadian economy – especially given laws on trade exposed industry and tax offsets for consumers. The future of the Earth system is unpredictable but far more dynamic than is generally appreciated. This makes the marginal benefit of carbon reduction impossible to quantify. Even as to the sign. Technology evolution is essential in any scenario and this ideally makes the cost of abatement negative. I am a great believer that democracies can do whatever they like as arrived at in the cut and thrust of politics. A political problem with carbon taxes is that they then feel morally entitled to share the pain. My view is that energy taxes lock in market distortions and higher prices based on guesses lacking any substance. The true market solution is a better mousetrap and the creative-destruction of capitalism leading to lower costs and higher productivity. About science: World’s first gene-edited babies! The Age of Designer Babies has arrived. Soon all women will look like Uma Thurman with the IQ of Marilyn vos Savant. Gattaca is here! I found the above good. The name calling shouting matches. I don’t think so. I don’t see that as where we’re going to end up. A wee bit of quantitative analysis showing NCA4’s addiction to speculation. “The recently released National Climate Assessment (NCA4) is a perfect example of what I have called the one-word hoax (Will versus Might). This hoax is to say that extreme events that “might” happen (but are extremely unlikely) “will” happen. NCA4 systematically pushes this simple hoax. Many analysts have pointed out that the NCA4 report is highly dependent on the use of speculative climate models. In many cases these “hot” models are completely unrealistic. In addition, the projection of adverse impacts on America is also based on questionable computer models. In the process of commenting on the draft NCA4 report I did a systematic analysis of their reliance on speculative computer modeling, both for climate change and for adverse impacts. The report itself is wordy and voluminous, but every chapter has from 3 to 5 so-called Key Messages. These are one to two sentence summaries of the discussion. Most of the 29 chapters are either on a specific region of America, or on a specific sector of the economy. There are just 118 Key Messages, so I analyzed each one to see if it was dependent upon speculation rather than facts. I found that 99 (or 84%) of the Key Messages were based on highly speculative modeling of worst case future scenarios. This was not surprising, because the NCA4 authors were specially instructed to focus on worst case scenarios. The hoax is to present this speculation as established facts, which is just how the NCA4 Messages are being reported by the mainstream media. The media is thus hoaxed. There is more of course, including the inane arguments they used to dismiss my comments. Each comment was responded to, at least nominally. They say the science is settled and cite themselves to prove it. The only solution looks to be zeroing the USGCRP. All it does, and has ever done, is churn out alarmist reports like this. The link seems to be missing. Such abusive nonsense is unnecessary. If he could be clever about it – it might be amusing. Translated from German – so the syntax is sometimes a bit odd. 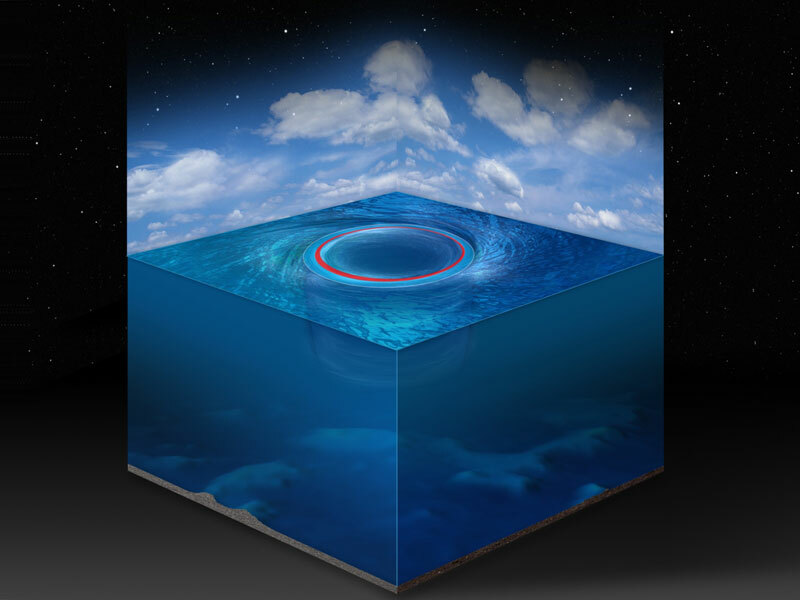 And I love this idea of ocean eddies being mathematically equivalent to black holes. if I have not introduced it before? The videos don’t work for me btw – but there is a pretty picture. So people adapt. They self insure. But as we read some of the quotes, these people have bought in. The article says the U.N. Stunned the world recently. They must mean the recent IPCC report. Well judging from the quotes, they did. Here’s what we have to look forward to. Young saying the stupidest things as above. They could always live under bridge inland somewhere. But climate scientists don’t say it’s going to be catastrophic hardly ever. We leave not saying that to websites like WUWT. That is, they say, it’s not going to catastrophic. This reminds me of Y2K. Where nothing happened. That reminded me of the segments from the 1950s Art Linkletter Show entitled “Kids Say the Darndest Things”. Except in this case it’s “ People Say the Dumbest Things”. I don’t understand why it’s difficult to visualize how slowly SLR really is. Even in the worst case, that 31 year old young man will be a doddering senior before the water threatens his abode. But then there was the guy living in Roanoke, Virginia who said he could literally see the seas rising. Yeah, right. He must have spoken to one of my liberal friends who advised me last year not to move to Florida because of sea level rise. I will have croaked a long time before the next inch of SLR hits the beaches in the Sunshine State. 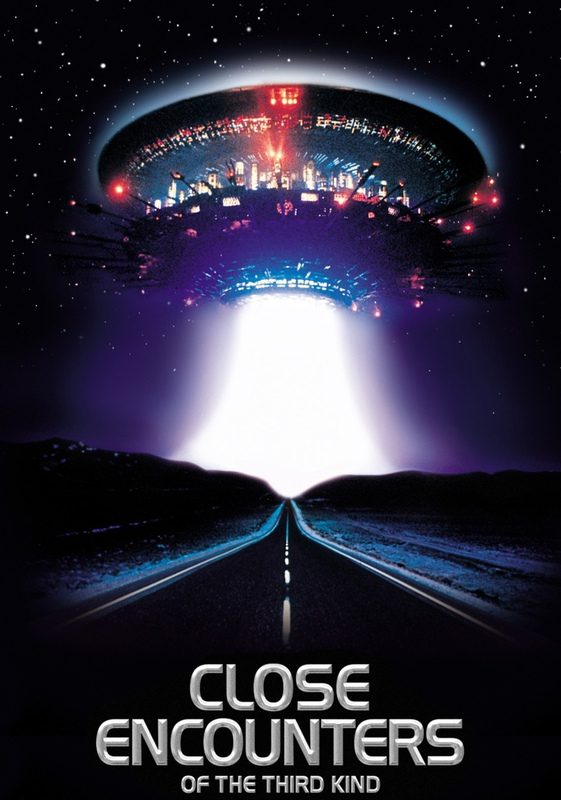 Science news: Have astronomers found an alien spaceship? CO2 warming, we’re told, is from elevation of the emission height with a decrease in the temperature thereof; thus the stratosphere (where the emission height is located) cools, less energy is electromagnetically radiated to space – and the planet warms. Fair enough. So that’s why for the last few decades the stratosphere has been cooling and the earth’s climate warming. Until now. Now, radiosonde data show that in the most recent decade, stratosphere temperature is increasing. What does this mean? Should be obvious, but apparently it’s not. Parsimonious explanation: warming has stopped, now earth’s climate is cooling. Explanation that we’re given instead: either another factor – ozone – just cut in and caused the change. Or, although the radiosondes show stratosphere warming, higher up where they don’t measure (so we have no data, just conjecture) – it’s still cooling. What’s so horrifying about the parsimonious explanation, that folks have to perform such contortions to escape from it? Last year winter cold deaths in the UK were the highest for 40 years. From the Nature paper on increasing extremes of rainfall: And it’s clear that such storms are carrying more moisture than they used to. The moisture in the air changes depending on temperature: heat that air by 1 °C, and it can hold approximately 7% more water. The Intergovernmental Panel on Climate Change has concluded that many parts of the world are already seeing increases in heavy precipitation, thanks to human-induced climate change. As I asked in response to the Romps et al paper modeling increased lightning ground strike frequency in a large part of the US: How much of such increase in rainfall can be powered by a 4 W/m^2 increase in downwelling LWIR? Has anyone besides me tried to calculate an estimate? So as I understand, the model has a circle of outcomes. Observations have a circle of outcomes. The two circles must overlap more than a tiny bit. And I think he’s talking about constraining uncertainties. If your model cannot ‘explore’ a significant amount of observed area, good luck. Curry sums this up I think as, the models run too hot, I am generalizing. To my mind, Lewis and Curry: https://judithcurry.com/2014/09/24/lewis-and-curry-climate-sensitivity-uncertainty/ stands as a good observational based study. There is a divide apparently involving Lewis and Curry on one side and the modelers on the other. Not surprisingly, I favor historical accounting over a model of what happened or will happened. The idea of modeling is complicated and I can’t give a good explanation at the moment. Many things are modeled and there is not a blanket position from me against all models. One could even argue our perceptions of the world are a type of model. This is some good writing by Lewis. I highlighted the original post here at Climate Etc on Facebook, but have developed a better understanding today where Lewis is coming from and some other stuff too. The one I am replying to is an Engineer. High performance computer drives I think. Nice; pretty much everything is based on a model, including the ways we humans should live. Why shouldn’t we follow the advice of the models when certain of our political models is, of course, advising us to do so. The map is not the territory. The cones and rods on my retinas help process light and gives me a model of what’s in front of me. An average temperature is not the temperatures of a time frame. It’s a model of that. A number that is your net worth is not your net worth. I’m watching Dave Rubin interview some guy from Human Progress. He brought up France today. People there want something and they are not listening to their elites. And the elites are not listening to them. The job of an accountant is to provide information that is useful to management. That didn’t happen in France. Who is at fault? Let’s go right at the climate scientists. You get to run France. From you comes the wisdom to run economies while saving humanity. This is just the start of the elites getting slapped around. The little people are catching on that the elites are finally out of their depth and don’t have acceptable answers. Economics are ultimately going to be the elites total fall from grace. For this generation, it’s multi-culturalism. The next generation will have to answer for declining standards of living. From 1945 to 2000, Real Growth in Adjusted Gross Income in US was 3.3% per annum. Since 2000 <1%. And we are doing better than Europe. My latest opinion is that the Republicans are now the party of the working class and are still confused by that and so am I. It may not be the the Republicans are right, but they are less wrong than the Democrats. But that’s not hard to do. Clinton’s campaign illustrates that. What was her platform? As a libertarian, I had simple answers for immigration and free trade. Now I am not so sure. Maybe I’ll be a moderate libertarian. But it has been a grand time. Trump brings out the worst in people. And there’s been a lot of that. But give him his due, he also brings out the best in people. And I think it’s important, to welcome people into whatever the cause is. Was this supposed to be about elites? That’s what we have. And I suppose they need to stay in touch with the voters or there may be things like no longer having their former job. Trump just happened to come along at the right time. He didn’t cause all this. He happens to be President in the middle of it. The simple answer is that enough hate for Trump will fix things. That’s blindness. A con. A few months back Macron was showing up Trump on the world stage about climate change. Now he’s back on the world stage trying to save the planet. Or Paris, or his job. Very true. While tactically unintended, Trump is an agitator which by nature is a catalyst for change. His instincts are generally in-line with near 50% of the population whose wishes have been unsatisfied for decades. But Trump’s political acumen is undisciplined; which is both a strength and weakness. Overall he represents a dangerous, uncontrollable force against elitism, a plus IMO. There are no tentacles from lobbyists controlling Trump, he channels the energy from his base who are mostly aligned with his policies (beliefs they’ve had before Trump came on the scene rather than a belief in Trump himself). It’s what makes Trump’s support unrelenting, unwavering, and too, why over 90% of MSM reporting is negative. He’s essentially an existential threat to the elitism that the MSM is paid to represent. The MSM is simpatico with global elitism mostly; either bought and paid for, or sycophantical by nature of collectivist indoctrination. The Left for decades has tactically implemented agitation as a catalyst, synergistic to propaganda, to facilitate change. This has historically been a formulaic program. Agitation is a force multiplier the Left has understood all too well (see Alinksy/Goebbels), they understand ideological threats. The war plays out over a mostly unsuspecting population. I like 90% of planet thought Clinton would win and was fine with that. She’s a moderate when she isn’t raking in baskets of cash from somewhere. We were going to be fine just like under President Obama and the show was going to be over. It is the fact that the Leftists just keeping doing whacked out things that I don’t see myself doing if Clinton had won, so I find myself not in his camp but thinking the leftists are really hurting the situation. And not drifting left but running there. They are becoming extremists. Vengeful. I am not used to being the reasonable one. Trump is dangerous. But so is the left. That’s how they often get their way. So often, people fold in front of a leftist assault. I think the odds are 80% that Trump will not. So I am hoping for middle support for those that stand up. Judith’s Twitter link in the upper left has an EnergyReporters link about sea level rise. If you don’t have a Facebook account, get one. Then you can share such articles with your relatives and if it goes a certain way, argue about climate change over the holidays with them and watch a lot of cat videos to boot. Stop sitting on your hands and help out. I think moderate articles like this EnergyReporters one strikes a good practical balance and help counters some of the headlines. I am saying you can do something about the headlines that may bother you if they seem to exaggerate things. And it will matter. Bottom up. Not top down. You and your relatives on Facebook. “…past catastrophic weather was once blamed on everything from religious insubordination to the deployment of the lightning rod, wireless telegraphy, First World War ordnance, atomic tests, and supersonic flights.” And Witches. The pessimists keep recycling their arguments across time. It’s an old shtick. Doom. That is not us. I’ve decided to stick my neck way out and see if my hypothesis is correct. Is the Next Big [Equatorial] Westerly Wind Burst On Its Way [in the Western Pacific Ocean]? Heather Heying formerly of Evergreen State interviewed by Dave Rubin. It’s good. The IDW. Moderate and correct. What are they doing? A big Triassic dicynodont – who knew? ‘How to make the world better. Really. With Dr. Bjorn Lomborg’ – New video. Peterson interviews him. Climate change is around 25:00. Lomborg make a good argument. I don’t think it’s Commies. I don’t think it’s propaganda, though I don’t know what to call it. It’s the process. Not of anyone here but of MSM. Of the online society. An easy example is the gender wars where a man is a woman. Yes you say. If not, the mobs go after you. Once they can get you to say that, it’s over. A big fire in California is an example of global warming. You say yes. You abuse 97% to add in dangerous and it’s all caused by us. I think that includes President Obama. Silent assent. The unity of the left on the issue of global warming I don’t think is its strength but a weakness that will grow. I don’t mean to condemn but to understand. A weakness that may have had something to do with the 2016 election. Whatever it is called, not propaganda, what scientist signed up for that? If I take the position that such a thing exists for climate science, where did it come from? Perhaps the IPCC which also came from somewhere. But now we are going near conspiracy and I don’t do that. They are attempting to do it with the gender wars, which as far as I know doesn’t have anything to do with climate change. Call it society that is failing in some areas. … We show that the EP-ENSO SST anomaly pattern and its centre differ greatly from one model to another, and therefore cannot be well represented by a single SST ‘index’ at the observed centre. However, although the locations of the anomaly centres differ in each model, we find a robust increase in SST variability at each anomaly centre across the majority of models considered. This increase in variability is largely due to greenhouse-warming-induced intensification of upper-ocean stratification in the equatorial Pacific, which enhances ocean–atmosphere coupling. An increase in SST variance implies an increase in the number of ‘strong’ EP-El Niño events (corresponding to large SST anomalies) and associated extreme weather events. Is intensify a science word? It will be hotter. That can be measured. Does the Nature headline mean El Ninos will be bigger? Perhaps faster developing or longer in duration. Or dropping from their peak in a shorter time. Droughts and rain will be more intense as how could it be otherwise? As the PETG drops it makes perfect sense that things will be more intense and not the more stable other way around. Things will get stuck without a strong differential to keep them moving along in an orderly non-intense way. A wrench thrown in the previous well oiled climate machine. As it warms for us, TMAX gets stuck and more intense by not going up as much as the average. If that’s not more intense and tubular at the same time, I don’t know what is? I realize this is not Global Mean T and a dozen other reasons why it shouldn’t mean anything, but SM has indicated a very high correlation between NA and Global Temperatures (96%? )so why shouldn’t there be very high correlation between US TM and NA Mean T? 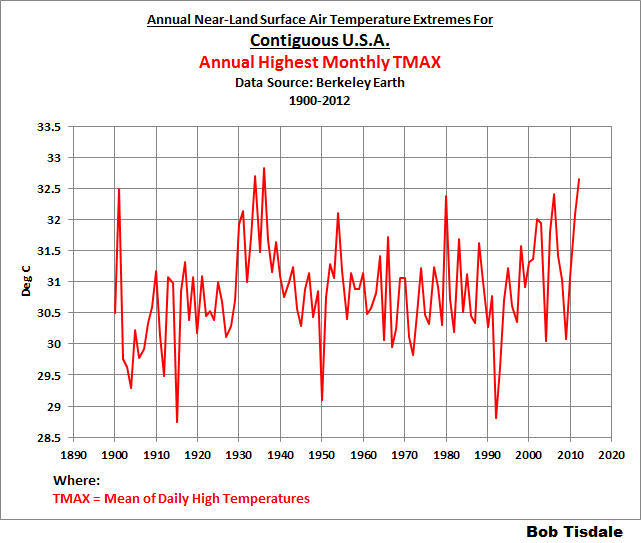 SM has lectured us on how the 1930s were not as hot as current temperatures and they haven’t been adjusted downward. 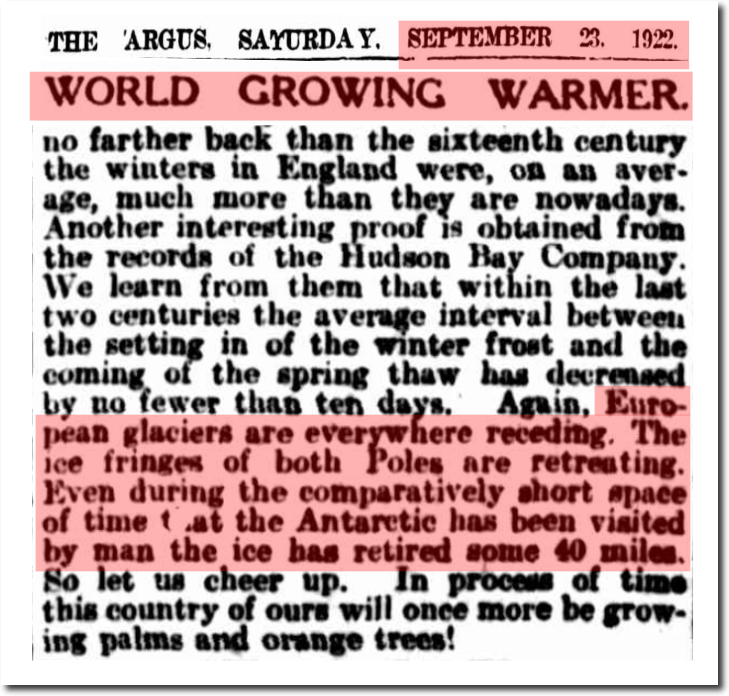 This appears all the anecdotal evidence of hot 1930s, (ignored by warmists)has some validity. But what do I know. Just because every contemporary account and history book said it was so, it cannot be unless SM and other warmists give it their blessing. It looks like the average went up but the TMAX hardly did. So while the distribution moved, there’s something holding the upper extremes in place. Could be that 4th power thing of the Stefan–Boltzmann law. This is good for Minnesota. It does get hot here, sometimes 100 F with humidity and low winds. And we burn all kinds of natural gas heating our homes. If a system is pushed as the climate is by CO2, what happens to its temperature distribution? Before it may be more random. The push organizes it. It is not random when it is on the way to somewhere. It’s accepted that the colds goes up more than the warms. The distribution tightens. What does such a thing mean for ENSO. More organization. See how a strong annual signal emerges towards the end? Organizes. 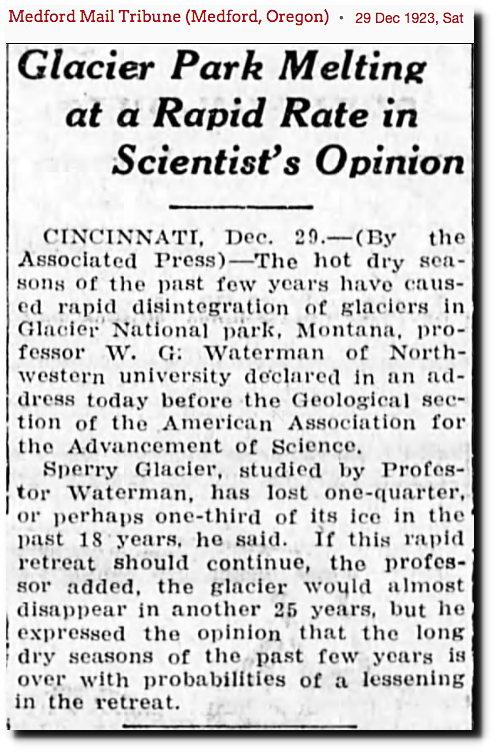 If not for warmists, nobody would know the temperature of the great plains in the 1930s. Station just down the road from Dad’s ranch: 120 F. Still tied for the hottest day in the state records. Why? Because my ancestors believed rain followed the plow. When their seedlings died an inch above the ground, they plowed their fields again, thinking rain would follow. In June they turned their fields of black dirt black, and they stayed black. Sun; black. Try it. That’s one of your more, let’s say, off kilter quotes. So all those who lived through it didn’t know? Those reporters who interviewed all those farmers and ranchers during that period didn’t know? All those who made documentaries in the 1950s didn’t know. Maybe I don’t understand your point. Or maybe you don’t have a point. It was common knowledge in the 1930s at the time it was happening. It wasn’t forgotten in the 1940s and 1950s when it was just part of all our education. Hot is hot with or without the most sophisticated thermometers. Maybe to the 1/10 of a degree they didn’t know. But they knew it was a lot hotter than the 1950s and 1960s.